Hello, lovelies~ I always advise those who are just starting out in skincare to always include a facial cleanser in their skincare routine. This is important to make sure that you always have a clean face before hitting the hay. Wouldn't want dirt and oil blocking those pores, right? With that being said, I'm back with another review of a facial cleanser that will be available in the Indonesian market this coming April. 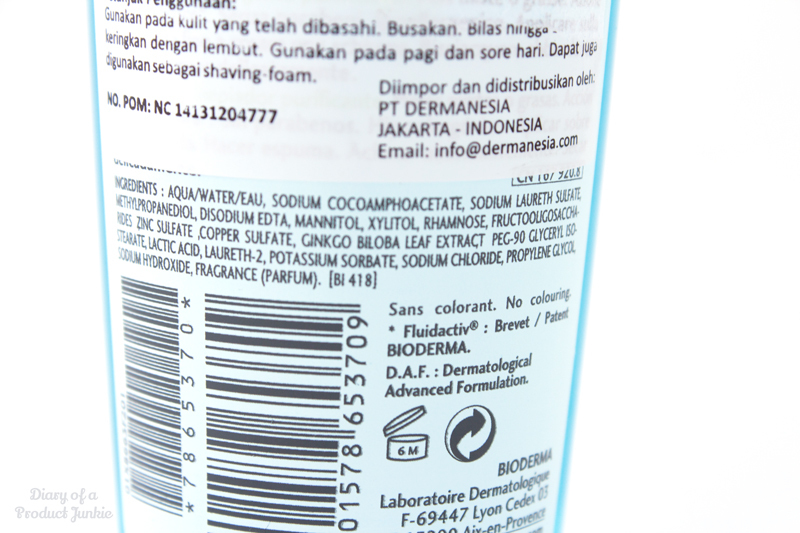 Please meet Bioderma Sebium Cleansing Gel! The cleansing gel is packaged in a transparent plastic bottle with a secure pump as the dispensing method. It can be locked to prevent accidental spills. As with most cleansing products, it contains sodium laureth sulfate that helps creates bubbles. It uses zinc sulfate and ginko biloba leaf extract to help reduce future occurrences of acne. It claims to be free of colorants, so I'm not sure what causes the blue color. It still uses fragrance, but it is devoid of any parabens. The product itself is a blue gel that is a bit hard to lather when I use my hands. I would normally dispense one pump onto my hands and rub them together to get foam, but it's a bit hard to create thick bubbles or foam. This can be seen as a good sign as it doesn't create too much foam that tends to dry out the skin. After washing my face with this cleansing gel, I notice that it doesn't 'pull' or make my skin feels tight, unlike other face washes that's meant for oily/combination skin. I wouldn't use this solely to remove makeup because it simply isn't meant to do such things. Sadly, this remarkable cleansing gel did not work for my oily, acne prone, sensitive skin. Within three days of using it, I broke out on my right cheeks and chin. Continued using it for two and a half weeks only to have the same result. Wah padahal claimnya buat kulit combination/oily ko bisa gk cocok ya ci. Wah jd ragu sm ini. Soalnya kulit mukaq 11:12 sm km ci cocok2an make barang. pas jerawatan ada pake produk jerawat yg ada malah makin breakout. Hello there, just became aware of your blog through Google, and found that it is really informative. I am going to watch out for brussels. I'll be grateful if you continue this in future. Many people will be benefited from your writing. Cheers! This is really interesting, You're a very skilled blogger. I've joined your feed and look forward to seeking more of your fantastic post. Also, I have shared your web site in my social networks!